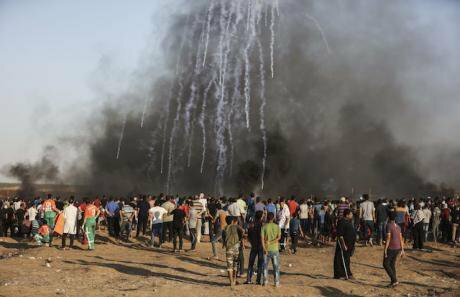 Palestinian protesters gather as a shower of tear gas canisters fired by Israeli troops land on the field east of Gaza City, on Aug. 10, 2018. Picture by: Wissam Nassar/Xinhua News Agency/PA Images. All rights reserved. Israel’s Palestinian citizens recently committed a serious crime, a clear case of democracy-terrorism designed to damage the very foundations of the only Jewish state in the Middle East: Their elected representatives dared bring Israel’s new Nation-State Law to the attention of the United Nations. And the response in Israel? Predictably, the reactions ranged from demands for an investigation of the Arab representatives by the Knesset’s Ethics Committee – as if there is any measure of ethics left in a parliament that legislates race laws – to calls for their expulsion from the parliament, the outlawing of all Arab representation, and physical expulsion to Gaza. Israeli Jews of a certain age may recall the popular “go to Gaza” curse, sometimes preceded by the observation that “the only good Arab is a dead Arab”. If the Arabs could not be killed, so the thinking went, at least there should be the consolation of sending them to Gaza, in a sort of a mini-transfer. Once there, Israelis reserved for themselves the right to teach the Palestinians a lesson should they get too uppity, as the people of Gaza have found in recent months. As they have protested Israel’s 11-year blockade on the tiny coastal enclave, the snipers of the most moral army have had their index fingers ready on the trigger. Not to be outdone, tourism minister Yariv Levin proclaimed: "In any normal country there's one definition for [their actions] – treason. I hope the judicial system tries them." He must have known that calling someone a “traitor” in Israel is akin to declaring hunting season on them. Separately or not, ongoing violent attacks on Palestinians in Gaza, the West Bank and inside Israel have been on the rise. For over a decade, Israel’s repeated, devastating attacks on the Gaza Strip, coupled with a prolonged siege, have had profound consequences. Death and destruction are evident everywhere: key infrastructure – roads, electrical systems, water and sewer – has collapsed; housing stock is destroyed; essential public health facilities are failing; children are malnourished; the economy is in dire straits and employment opportunities non-existent for most. With Israel’s noose set tightly around Gaza’s neck, and the prospects for an end to the 51-year-long occupation now gone, a popular uprising brought about large weekly demonstrations this past spring and summer along the fence separating the Gaza Strip from Israel. Over several months, Israeli military snipers have “picked off” unarmed demonstrators as targets. The result: over 160 lives terminated and thousands of others afflicted with life-long injuries, among them many children, now doomed to survive with missing limbs, paralysis and damaged organs. These assaults reflected a purposeful Israeli policy: the selection of ammunition – "butterfly bullets" – designed to maximize bodily damage. Israel knows only too well that Gaza’s medical infrastructure is incapable of properly repairing such serious injuries – hence the large number of amputations. On the frontiers of the Wild West Bank, meanwhile, it is business as usual: the occupation is thriving, and expanding, intently and methodically. Recent legal decisions have empowered the Israeli government to push the boundaries yet further. In another case, the Jerusalem District Court recently ruled that an outpost settlement – these are viewed as illegal even according to Israeli law – could be “legalized” retroactively. Haaretz reported that the court accepted in “a precedent-setting ruling” the claim of the outpost’s residents that “transactions conducted in good faith under certain conditions are considered valid – even if they have certain legal faults”. The conspiracy to steal Palestinian land over many decades and in violation of international law was dismissed as similar to buying “stolen goods” in error. In parallel, Israeli human rights organization Yesh Din reported on a “price tag” pre-Holiday Special: Ten attacks by settlers in ten days, in the first two weeks of Elul, the month of mercy that precedes the Jewish High Holidays. They included throwing rocks at Palestinian cars and homes, burning a tractor, uprooting more than 200 olive trees, destroying a water well, puncturing car tires, smashing windshields and scrawling hateful graffiti, as well as carrying out extremely violent attacks on individuals. In addition, those perpetrating crimes against Palestinians have shown that they are equally capable of hurting Jews. They recently attacked Jewish activists, members of Ta’ayush, who were trying to protect the Palestinian population in the West Bank – in place of an occupation army that has forgotten that is one of its duties. The true war criminals, however, those holding ultimate responsibility for such actions, are the members of all Israel’s governments and all its military commanders. According to international law, they are required to protect the occupied population, but instead they have done the exact opposite: They have overseen a process of ethnic cleansing whose purpose is to minimize Palestinian presence in the West Bank, the small territory remaining of the Palestinians’ original homeland. While in police custody, Farah’s knee was broken. More recently, three Palestinian citizens of Israel were attacked by eight Israeli Jews armed with knives and chains on Haifa's Kiryat Haim neighborhood beach. The gang was reportedly heard saying, “Arabs should not be at the beach” and “They should go to their ‘own places.’"
Indeed, it is in the interests of the Jewish State to further minimize Palestinian presence in the public space. Because it has been impossible until now to expel Palestinian citizens from universities, hospitals and pharmacies, some restless Israelis have in the meantime set about the preliminary task of cleansing the beaches and the Knesset of Arabs. For those who care to examine the past, the patterns are unmistakable. Since 1948, a process of people replacement has been underway (I covered it in greater detail here): ethnic cleansing, now taking place daily, mainly in the West Bank, using a variety of methods and at different locales. The separation and isolation of the Gaza Strip from the West Bank, the siege and the attacks are part of that same process. Attacks against Palestinians, whether in the West Bank or within Israel proper, constitute pieces of mosaic in those patterns. The goal – in 1948, in 1967, and since then – has been as much territory as possible and as little “foreign” population: the natives that have lived in the country for, at the very least, many hundreds of years. This holds as true in Area “C” in the West Bank as it does on the Kiryat Haim beach in Israel. The Nation-State Law, the object of protest by Palestinian citizens of Israel and more than a few Jewish Israelis, is enmeshed in the same “cleansing” procedure. A strong people minimizes the presence – whether physically, visually or representationally – of a weak people: a process that is fundamentally illegal according to international law and profoundly obscene according to all ethical codes. Israel is proving to the world that it is most certainly not a state of all its citizens. Those who are not Jewish, the Palestinians whose families survived the Nakba, may have some rights – more than can be said for Palestinians in the occupied territories – but they are lesser citizens, citizens on constant probation. And just as their knees are much more vulnerable to police violence, they are entirely exposed to the Jewish pogromists, whether on the beach or in the Knesset. The members of the Joint List are right to reach out to the UN and the international community. In front of our eyes, the State of Israel is turning into a democracy for Jews only. And even some of those Jews are being put on notice.